My alarm goes off early. Although I have no plans, I think I'm done with this town. I guess I'll take a car east, to Palmyra. I'm packed by 7:45 am. After breakfast on the top floor, I head back to the reception desk to learn what tours will be going out today. 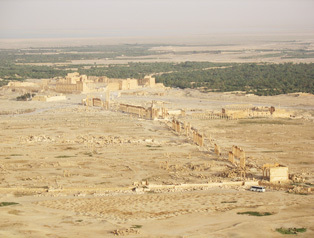 The plan becomes for me to get a ride west to Krac, then east to Palmyra, where I will be left to bicycle back to Damascus. 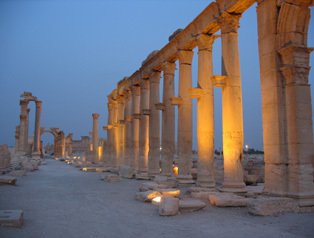 Since I won't be coming back in his car, 1000 Syrian Pounds is knocked-off the posted Krac - Palmyra tour charge to bring the fee to 3,500 pounds or $70. I grill the manager for more information about the ride back, which is supposed to be difficult. 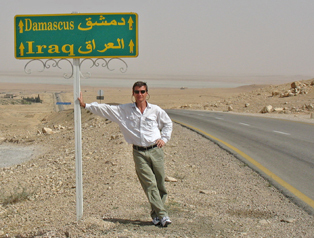 He mentions a stop, the Babylon Café, about halfway between Palmyra and Damascus, where I can camp-out. I check out of the hotel, and carry my bike down to the big American car that's waiting: a 1952 Pontiac Eight. I'm apparently the only passenger, and this seems like a great deal for $70. I keep my eyes out the window as we travel so I can see what biking this stretch would be like. The ride south to Homs looks pretty bland: slightly rolling highway, with the beverage/food stops much further apart than they were on the smaller roads. At Homs we head west and I'm still not impressed by the countryside. I do notice that many of the trees are growing at a very tilted angle, pointing inland. We turn north again, towards Krac and this stretch would have been a pain on a loaded bicycle. The climb increases. 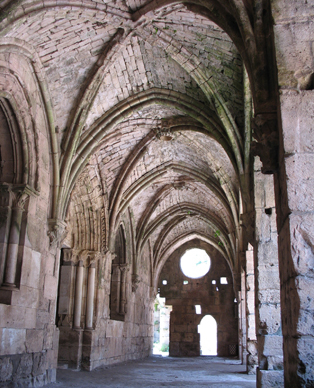 When he gets there, I am in awe: Krac des Chevaliers rocks! It's as photogenic as can be and it's build to last. The grounds are mostly empty; one group of about twenty Arabs, maybe five other tourists. I put on tunes, and wander the grounds. About an hour or so later I wander outside, and after a lunch stop, we start driving to Palmyra. Once we're east of Homs, I study the terrain, realizing that I will be bicycling back this direction, though not on this exact road. The overriding issue is the scrub pines all growing at a 45-degree angle, pointing inland toward Palmrya. Clearly, there's a prevailing wind that will be a headwind if I'm bicycling west. It's 240 kilometers from Palmyra to Damascus. I've seen no food/beverage stands. The wind is 100% the wrong direction. There is absolutely nothing to see. As we approach Palmyra, I spot a sign for Iraq. I have the driver pull over and get him to photograph me with the sign. We're out in the middle of nowhere. "Injun country." (I'm sure that I shouldn't be using that politically-incorrect movie reference, but there's a feeling to this place…) We continue on, rounding a bend. There it is. My one reaction is the scale of it all. The ruins seem to cover the whole plain. 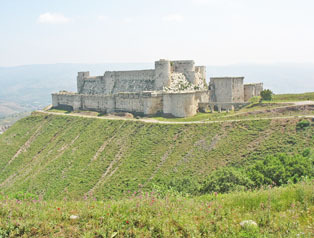 In a few moments we are where the town presses against the ruins, and at the recommended hotel. The room's bright and has a view of the ruins, and the manager proposes $15. I sense that I am seen as easy pickings, and ask my driver to show me another hotel. The room is now offered to me for $12, and I take it. In the reception area is a British woman, Gail, who is apparently a passenger for the drive back tomorrow morning. She is having some kind of argument on the phone with her tour organizer (my hotel guy, I think) about being charged $80 each day for driving, when her day out in Palmyra has had no driver. I stay uninvolved. In the room I shower and relax, staying out of sun for another hour or so, until it cools down. Both my guidebook and tourist office across the street say that viewing the sunset from the hilltop castle is particularly nice, so that's my plan. 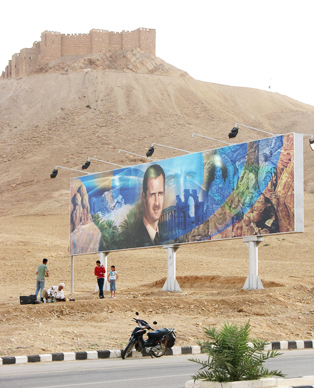 At around 5:30 pm, I head up to the castle, stopping to catch a fun photo of locals posing in front of a Bashar billboard. At the entrance to the Arab castle I'm bothered by vendors, but I continue another hundred feet past the entrance to the castle and I'm left alone. I have a perfect late afternoon: listening to MP3 tunes, and soaking up the amazing view. Two other tourists join me at my quiet little viewing spot. Hanna and Mary apologize for interrupting my solitude and offer me a glass of red wine. (I pass, but am very impressed by their fun approach to seeing the sites!) They turn out to be NGO (non-governmental organization) staff, living in Sudan! We chat for a few moments and they invite me to join them for dinner. I say yes and mention that there's another Brit in my hotel who would probably love to join us. They love the idea. I bicycle down, and then continue to the main ruins. It's getting darker. I stop briefly to take a few photos, but then continue biking. The wind is picking up, sand is blowing everywhere and the experience of night-riding through these two thousand year old ruins can only be described as surreal. I clean up at the hotel, spot Gail downstairs at the bar, and tell her about dinner plans. She jumps at the chance, and we head over to Traditional Palmyra Restaurant. It's a nice evening, and the company is something: one woman lives in Khartoum, one in Darfur, and one in Phnom Penh. I ask each about their experiences traveling, their recommendations, etc. Hanna and Mary tell me about their visit to Baalbek, just a week ago. They stayed at the Palmyra Hotel, apparently frozen in a different era. Two elderly brothers, fixed in their ways, run the hotel. Rooms are priced at $38, and non-negotiable, and perhaps as a result, the hotel was quite empty. Hanna and Mary didn't mind the funkiness - it was part of the charm. Gale was in Cappadocia just a month or so ago. She splurged on one of the balloon rides, and recommends it. "At Cappadocia pay for the best balloon ride. The best balloon companies shift their launch-points every day, so you get the best ride. The cheapest companies launch from the same place every day, and some of them seem to land at the same location they've launched from." The evening wraps up. Gail is taking my car back to Hama tomorrow first thing in the morning; the other two women are taking a bus at 11:30 am back to Damascus. I have no idea what I'm doing. 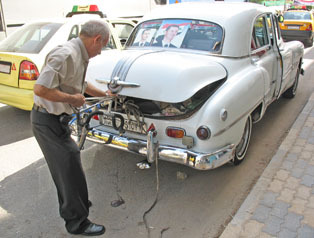 The Riad Hotel's Poniac Eight - with my bike sticking out of the trunk. Though the most impressive thing about Krac is its bulk, there is also fine detail. Everything in one photo: a waterpipe vendor, some kids who pulled over to take a photo with Bashar, and the Arab Castle. The scale of the ruins is nice; but the absense of modern construction pressed against the ruins makes them particularly special.